tree, due to its ability to nourish infants, and increase the milk supply of nursing mothers. to withstand cooler than normal temperatures. These little guys of ours made a spectacular comeback! we sell it? We do! But, is it our favorite? No, but it WOULD be, if it weren't for Stenopetala. for a good example of the differences. Both Moringa, but very different. The little thumbnail photos below, will enlarge, if you click on them. The ones on the left, show 2 seedlings that actually SURVIVED 28 - 40 degree Fahrenheit temperatures, during the 2010 winter, here in Florida. It was a rough winter, for those of us who are not used to having temperatures that low, at night. They looked like "sticks", but have budded out down their entire trunk, right to the ground. On the right, are photos of 2 week-old Moringa Stenopetala seedlings. They are just delightfully resilient plants, and when they are only a few weeks old, we harvest most of their leaves, and eat them. Moringa Stenopetala seeds are a bit harder to obtain than Moringa Oleifera, but we usually have a good supply on hand. On occasion, we run out, but eventually get more. If you prune your Moringa Stenopetala trees a lot, you will have to wait years, before they produce pods. If you simply let them grow, you should have flowers and pods within two years of planting them. 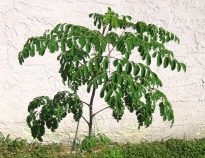 They do not produce seeds as freely as the Moringa Oleifera trees do, but they also do not like to be pruned as often. You can still harvest the leaves, but leave some on the tree so that it will be encouraged to blossom and grow seed pods. "Hi! My name is Stan. about me, the African Moringa Stenopetala seed!"